You don't have to be a bond trader or follow every self-appointed TV expert to keep a studied eye on interest rates. In fact it can be done much more easily by watching a bellwether ETF. 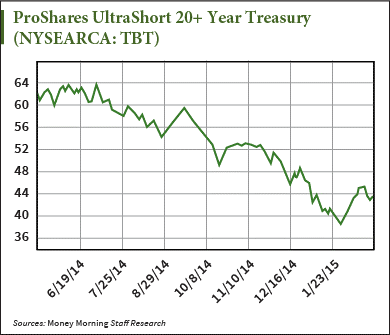 Once rates do start to inevitably increase, we can use ETFs to profit from the change. 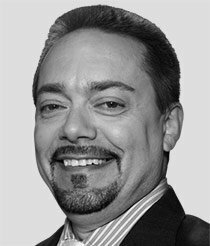 But we can also exploit rising rates' effects on the big brokers – one in particular – and employ a simple options technique to maximize our gains. I'll show you how. 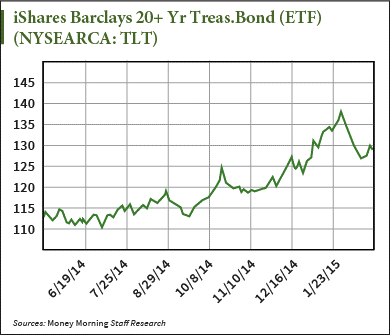 I regularly watch the iShares Barclays 20+ Year Treasury Bond ETF (NYSE Arca: TLT). This largely mimics the Treasury bond market. This ETF acts much as a Treasury bond would, in that as interest rates fall or are expected to fall, the price of TLT will rise. If interest rates rise or the market expects monetary policy to tighten, the price of TLT will fall. Interest rates at historic lows and an expanding economy make me believe that the bullish days for TLT will soon be behind us. Anyone that has been in this business for very long knows the market always precedes moves in the economy, often by months. That means if the Fed starts to tighten monetary policy in September, the impact on the bond market could start as early as this spring. If that's the case, we want to be ready with our finger on the trigger of opportunity. The first thing the "shoot from the hip" trader would do is start selling bonds, or the TLT ETF above. If you believe the price of a particular asset is going to fall in the future you close out your long trades and/or short sell the asset. Short selling involves borrowing the asset from your broker and selling it to open a position with the intention of buying it back more cheaply if the asset's price drops. This all makes sense, but I want you to start asking this question, "WWTD," my acronym for "What Would Tom Do?"